When Samsung released the Galaxy S8, with its infinity glass display, it instantly made every smartphone in comparison look dated. Land Rover has achieved a similar effect with the Range Rover Velar, because after using the Control Touch Pro Duo, we're sure we've seen the future of infotainment systems. Buttons are doomed. But more on that later, because the Velar is more than the sum of its parts. 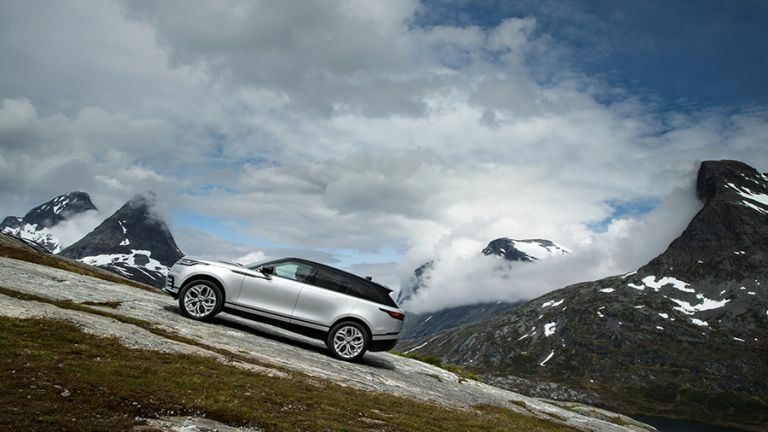 I've travelled hundreds of kilometres in the new Range Rover, through scenic fjords, along harsh coasts, and even up a ski slope into the clouds. The first thing that hits you about the Velar isn't how it drives, it's how it looks. It's an incredibly striking vehicle with a lot of presence and purpose. The Velar has a tapered silhouette and a powerful but not overly aggressive stance. It's a beautiful balance between futuristic and classic lines, and looks amazing when stationary, and even more amazing on the move. Just like Tesla and other futuristic cars, the Velar's door handles lay flush with the body until they're needed. This is not just an awesome futuristic feature, it also reduces drag on the vehicle and improves efficiency. In fact, this is the most aerodynamically-efficient Land Rover ever produced, with a drag coefficient of only 0.32. The designers at Land Rover wanted to create a car that made its owners glance back at it in the car park, and I think they've absolutely nailed it. Once inside, the Velar it's equally impressive. The cabin is like and oasis of calm. Mirroring the exterior design, it's elegant, simple, and luxurious, overflowing with soft leather and premium materials. All of this creates a relaxing, otherworldly spa-like atmosphere (which can be essential in commuting traffic). I spent a fair amount of time behind caravans in Norway, but my heart-rate didn't rise above 80bpm. Very impressive. This atmosphere is created, in part, by the Velar's new Touch Pro Duo infotainment system, which is made up of two 10-inch high definition touchscreen. When off, these screens blend seamlessly into to glass surface, but when on, become an intuitive and powerful way to interact with the car. Most of the car's features and functions are controlled on these screens in conjunction with two rotary dials. Start the engine and you're presented with media controls (this start up screen is programmable, if you'd prefer Vehicle Dynamics, you can have that instead). Choosing from the tabs along the top; Climate, Seats, Home, Vehicle, and Settings, will change what information is on the screen, and what the rotary controls do. This is one of the first breakthroughs - you're never bombarded with options like you would be if every function had an individual button. I think this makes the system more intuitive to use than most out there. Select the Vehicle tab and you've given the All-Terrain Response settings. Here you can tap which setting you want, or scroll through them with the rotary control. Head over to Climate, and the rotary control you've just been using to select Terrain Response has turned into your temperature control dial. All this can be done while the sat nav remains on the top screen, so you don't miss any essential directions. The UI has been extremely well designed, so buttons are easy to hit (with a bit of leeway built-in to avoid miss-hitting), and nothing is hidden behind complex menu systems. Land Rover engineers have done a great job. This has also been mirrored on the steering wheel, where capacitive touch buttons light up or turn invisible depending on what you're trying to do, in-order to simplify the amount of information you're getting. Honestly, I was ready to hate the Control Touch Pro Duo system, but after using it I'm happy to say I was wrong. It's a beautiful, intuitive, and powerful way of interacting with the vehicle settings. Of course, it's not perfect. You do need to take your eyes of the road to use it, which is where it lags behind the rotary-based systems (found in Land Rover's German rivals, BMW, Mercedes and Audi). Personally, I think the extra functionality makes this a more comprehensive system and it has a far quicker learning curve. Perhaps one area it could easily be improved is by implementing localised haptic feedback, using tiny vibrating actuators to define button outlines on the touchscreen and provide physical acknowledgement to the user when a button has been pressed. We've seen this tech in early prototypes from display makers, but nothing on the market yet. Maybe it'll feature in Control Touch Pro Duo... 2. Screens aren't limited to the centre console, there's also a customisable 12.3-inch display behind the wheel (on all SE models and above), which displays key driver information such as speed, gears, rev counter, and navigation. And, of course, you've got all the driver assistance and safety features you'd expect in a luxury SUV, including adaptive cruise control, lane guidance, and automatic everything. It's not just the interior that creates this calming atmosphere, it's also the way the Velar drives, too. I drove the D300 and P380 engines, both of which sit at the higher end of the range. The petrol is T3's engine of choice, which also happens to be our favourite unit in the Jaguar F-Pace. The Velar is much softer to drive than the F-Pace. The engine is quieter, it rolls more through the corners, and lacks the guttural punch the F-Pace can give you. All of that's too immature for the Velar. Although, the Velar never feels underpowered and will get up to speed with ease, but lets you enjoy the ride, more than the drive. Now, even though the Velar is Land Rover's most focused vehicle yet, it wouldn't be a Land Rover launch if off-roading wasn't involved, and, luckily, I had plenty of opportunities to test out the all-terrain capability of the Velar. All models are all-wheel drive, but not in the same way as most other Land Rovers. Instead the Velar is setup similar to the F-Pace, where it favours rear-wheel drive and will transfer drive to the front wheels when necessary. Still, we didn't have any problems climbing (or descending) and rather steep ski slope (other than some hot brakes at the end of it). With air suspension you have 251mm ground clearance, 24-degree approach, 27-degree departure and 650mm wading depth. It'll get out of a sticky overflow car park, or to a shoot, with no problems, and that's all you need to know, basically. It’s impossible not to be enamoured by the Range Rover Velar. It’s stunning, comfortable, capable, and, above all, calming. But it’s the sheer amount of cool technology in this thing is which we love most - it feels like a real game changer.